Pumpkins aren't just for halloween... today I've paired them with an Autumn sentiment on my tag design. My pumpkins (Penny Black 30-372 Autumn Splendor) were stamped onto my tag cut from watercolor paper using Penny Black's Creative Die, 51-007 Tagged. I then painted the image and background with watercolors. Once dry, using an ink blending tool and foam pad, I inked the edges of my tag with Distress Ink. Finally, I stamped my sentiment and added the ribbon and twine. 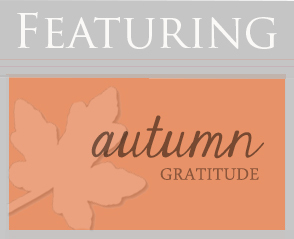 Thanks so much for joining us for the last few weeks as we celebrated "Autumn Gratitude." It's hard to believe it's almost December!